On the outside of the jewel case of this double-CD Sony album is a promotional sticker that touts "A Revolutionary Approach" to the playing of the Viennese waltzes and dances offered on the disc. What is that approach? Well, Harnoncourt "re-interprets" the music and uses ten different kinds of trumpets and five different sorts of clarinets. He further asserts that the concert waltz genre should be taken seriously, not treated as light music, and presumably, in that spirit, his interpretations would be targeted at finding greater expressive depth. Incidentally, the album notes by Professor Dr. Otto Biba, go to great length to decry a classification system that separates music into categories of light and serious. True, some good waltz and dance music may be undeserving of what has become a condescending label – "light music". Perhaps we should apply a different name to it, but the problem is, I'm not sure this is an issue of great concern. In any event, the instrumental sound Harnoncourt and Concentus Musicus Wien produce here is certainly a bit different, perhaps most noticeably in the often lighter tones of the trumpet. But, ultimately, the playing really doesn't cause the listener to view this generally cheerful, bouncy music in a significantly more serious way. That said, the performances are simply excellent in their spirited playing, colorful sonorities, well-judged tempos, vast range of dynamics, and precise execution. I've heard my share of waltz and dance discs, but this double-CD offering is as splendidly played as any. Period. Considering his stated approach, Harnoncourt's unerring sense in capturing the plentiful humor present in most of these works is perhaps a bit unexpected: try the charmingly mischievous percussion in Mozart's Kontretanz in C (K. 609, #4), or the forlorn but drunken solo violin passages in the 6th German Dance, or the elder Strauss's Paganini Waltz, a piece whose elegant high spirits alternate with boisterous lusty music or playful prankish moods in an interweaving of the most colorful fabric. Here and in the other Mozart and Strauss, Sr. offerings, Harnoncourt doesn't ever miss his target. By the way, the Kontretanz (K. 609, #1) should be familiar to many, as it was used in the film Amadeus when Emperor Joseph II played a variation of it on the piano, after which Mozart sat down to perform it as well. In Harnoncourt's reading here it is irresistible as it bounces wittily along. The Lanner disc is just as much a delight, as Harnoncourt and his forces capture the chipper, colorful moods splendidly: what a joy the opening work is here, Pas de neuf nach Saverio Mercadante. At over fourteen minutes, it's the longest piece on either disc by far and brims with a colorfully festive sense, and perhaps more than any other work here has a fairytale balletic quality about it, almost auguring Tchaikovsky, especially in the quieter, more playful passages. Festivity and playful quiet music alternate deftly as well in the Hans Jörgel-Polka, another delight here. Delightful also are the uproarious Malapou-Galopp and the Hexentanzwalzer. The former piece features humorous shouted vocal parts and the latter an imaginative and infectious variety of joyful moods. 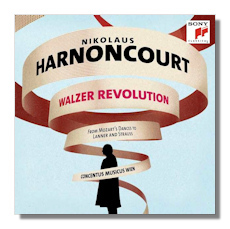 In the end, even naysayers of this genre would have to concede that if nothing else, Harnoncourt demonstrates the multi-faceted character of this bright and spirited music, and does so in superb performances, which Sony captures in vivid, powerful sound. In all, there are twenty-three selections here that should appeal to dance music mavens, as well as those wanting to sample what some will assert is actually a revolutionary approach to this genre. Highly recommended. Copyright © 2012 by Robert Cummings.